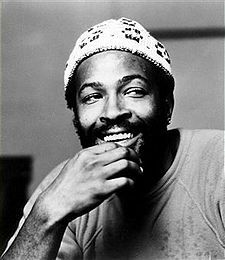 Marvin Pentz Gay, Jr. (April 2, 1939 – April 1, 1984), better known by his stage name Marvin Gaye (he added the ‘e’ as a young man), was an acclaimed American singer-songwriter and musician with a three-octave vocal range, who achieved major success in the 1960s and 1970s as an artist for the Motown Records label. He was shot dead by his father on April 1, 1984. Starting his career as a member of the doo-wop group The Moonglows in the late 1950s, he ventured into a solo career after the group disbanded in 1960, signing with Motown Records subsidiary, Tamla. He started off as a session drummer, but later ranked as the label’s top-selling solo artist during the 1960s. He was crowned “The Prince of Motown and “The Prince of Soul.” because of solo hits such as “How Sweet It Is (To Be Loved by You)“, “Ain’t That Peculiar“, “I Heard It Through the Grapevine,” and his duet singles with singers such as Mary Wells and Tammi Terrell. His work in the early- and mid-1970s included the albums, What’s Going On, Let’s Get It On, and I Want You, which helped influence the quiet storm, urban adult contemporary, and slow jam genres. 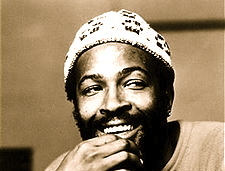 After a self-imposed European exile in the early 1980s, Gaye returned on the 1982 Grammy-Award winning hit, “Sexual Healing” and the Midnight Love album before his death. In 2008, the American music magazine Rolling Stone ranked Gaye at number 6 on its list of the Greatest Singers of All Time and ranked at number 18 on 100 Greatest Artists of All Time, and he ranked number 20 on VH1’s list of 100 Greatest Artists of All Time. Gaye was posthumously inducted into the Rock and Roll Hall of Fame in 1987.